"Lark's Morning Glory Gigi "
Larks Morning Glory, aka. Gigi, is the granddaughter of AQHA Hall of Fame, 2x Superhorse, and versatility World Champion Rugged Lark. 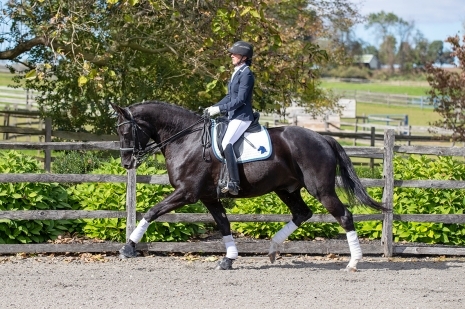 Her dam is an imported Canadian TB who is approved for breeding by multiple Warmblood registries. Gigi has siblings on both sides successfully competing in hunter/jumpers, eventing, dressage, breed shows, and western dressage. Gigi has shown to 2'6 in the hunters and jumpers, wins in dressage, has been well schooled cross country, and participated in pony club with her Junior owner. Gigi has correct conformation, beautiful movement, and an easy-going disposition. Her natural balance and willingness to please make her the perfect show ring partner. Gigi has a solid foundation and lots of professional training that will take you any direction you want to go. Once Gigi is done with her show career, she will make an outstanding broodmare.